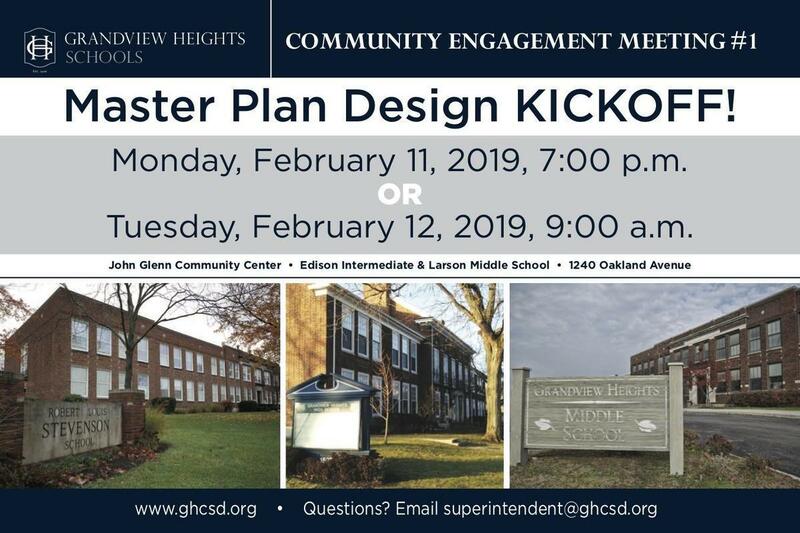 Grandview Heights Schools will host the first of three scheduled Building Design Community Meetings on Monday, February 11, 2019, at 7 p.m. in the John Glenn Community Center at Edison Intermediate & Larson Middle School, 1240 Oakland Avenue. The same meeting and presentation will also available on Tuesday morning, February 12, at 9 a.m. at the same location. Attendees will learn more about the project overview and design process and the projected timelines. 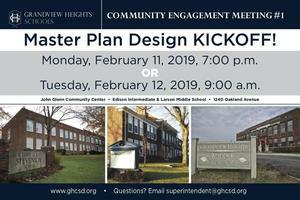 As we enter into the important design and construction phases of this process, we want you to continue to “Join the Conversation.” Please attend the community meetings and visit this website to stay informed on the progress and any future meetings regarding the design and construction of the school buildings. We will also be sending out newsletters, mailings, and emails about the project to keep our community updated. If you have any questions, please feel free to email superintendent@ghcsd.org. Thank you for your continued support of our schools and students.